The end of our summer wet season has given Fraser Island a refreshing new lease of life… amphibian life that is! Throughout the Wallum heath and Paperbark forest – just a stone’s throw from Kingfisher Bay Resort’s Centre Complex - our charismatic amphibians filled the air with a chorus of calls. Each night, guests and Rangers alike listened intently for the sounds of the Wallum Rocketfrog with its fast ‘quacking’ or ‘yapping’, the Striped Rocketfrog’s intermittent ‘chirping’, the shy Cooloola Sedgefrog with its ‘reek… pip pip’ and the Wallum Sedgefrog’s ‘creek… crick’. Occasionally, Green Tree frogs (picture courtesy of Grant Webster's photostream on Flickr) would also join in the Fraser Island choir. 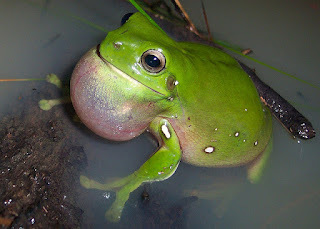 Did you know that frogs are the only Amphibian native to Australia. Toads are frogs, but there are no true toads native to Australia! Cane Toads – including the ones found on Fraser Island - are actually introduced pests. One February night, as we strolled through the Wallum with our guests in tow, a rustling in the undergrowth caught our attention. What could it be? As we waited and watched in silence the creature started to emerge… it was a Bandicoot! These endearing nocturnal marsupials spend their nights digging for insects and plant roots under the sand. They also have one of the shortest gestation periods of any mammal in the world – it’s only twelve days from conception to birth! After birth, the joey climbs through the mother’s fur into the pouch where it feeds on milk until it’s developed enough to emerge. The waters of Great Sandy Strait, on the lee side of Fraser Island, were alive with all manner of creatures over the past month – and all clearly visible - whether sailing on the Shayla Cruise, paddling on a Jetty Hut canoe, or up close on one of our Ranger Guided night walks. Over the past month we’re spotted Blue Spotted Rays, Logger Head Turtles, Barramundi, Squid, Mud Crabs and Solider Crabs to name a few. For guests headed our way, the Jetty is a great spot to see our marine life in full glory – as is the journey from River Heads to Kingfisher Bay Resort - so keep your eyes peeled. The Milky Way, containing over 200 billion stars, provided an impressive back drop as we searched the tree tops for Sugar Gliders, Tawny Frogmouths and the many Microbats that frequent the island. We look forward to seeing what March brings and to showing you all that's wild and wonderful on gorgeous Fraser Island. A Tale of Flycatchers, Oystercatchers, Honeyeaters and More! As we’ve bid farewell to February and the last heady days of summer, we’ve enjoyed some fabulous bird watching on Fraser Island and in and around Kingfisher Bay Resort’s Centre Complex. A Pandanus tree, alongside the resort’s main swimming pool, is now home to a new family of Blue-faced Honeyeaters (pictured right). The mating pair is regularly spotted – their vivid sky-blue faces in sharp contrast to the green palm-like leaves - on our morning walks as they tend to their chicks. 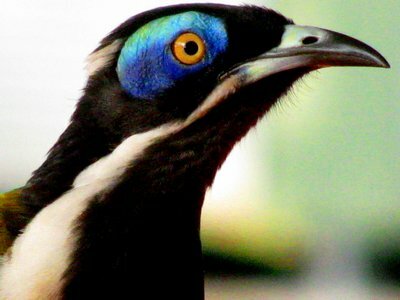 Did You Know that the Blue-faced Honeyeater is the quintessential early bird and is often heard calling thirty minutes before the sun rises! Another bird that we spotted nesting around the resort this month is the Leaden Flycatcher, whose nest was spotted high in a beach-side paperbark tree. Male and female Leaden Flycatchers are dimorphic, which means that their colouring and markings are so different that they look like two different species! In this case, males have dark heads and white breasts, whilst females have a blue head and distinctive orange breast feathers. As they say – one good ‘tern’ deserves another and down on the beach this month, Crested Terns have made way for the Gull-billed Terns. These similarly sized birds are differentiated from each other by beak colour - the Gull-billed terns have a jet black beak and their crested relatives sport a vibrantly yellow beak. Pied Oystercatchers also made a cameo appearance on the beach this month. These large black and white birds sport bright orange legs and bills. Their bill is extremely strong to allow them to feed on bivalve molluscs like pipis and oysters. They use their strong bills to cut open the muscles that hold the bivalve’s two shell halves together, allowing them to eat the soft body inside. We’ve enjoyed many a morning watching them in action. This February an old favourite has once again brightened our morning bird walks - Eastern Whipbirds - which failed to make any appearances last month - have returned to Kingfisher Bay’s grounds - their loud whip-cracking calls make them easy to locate in the Wallum undergrowth. This month we watched as a pair busily scratched around in the leaf litter in search of insects and other invertebrates. The coming of Autumn will no doubt bring about changes in the types of birds we see around Fraser Island - particularly our migratory species so stay tuned!